If you need an app to tell you what your personal minimums are you shouldn’t be flying an airplane. Any reputable flight app already tells you what you need to know just by looking at the weather forecast. On top of that, I can’t pull up several larger airports in this app. Airport identifiers are correct (checked in ForeFlight) but aren’t found in this app, even after changing the distance from my location to the maximum. I would have given this zero stars if it was an option. Don’t waste your time or money. I started using this app when I was getting my private. I'm no weather expert and never will be. You set the parameters that you are comfortable with and can quickly tell whether it's a good day to fly or not. Highly recommended for the general aviation pilot. Better than a lot of risk assessment tools I've seen. Developers are responding to feedbacks proactively. Impressive! I've been a long time user of ForeFlight and AirWX for weather, and since using Takeoff, I haven't looked back. Takeoff provides the info that I need in a super easy to understand way. Instead of having to compare clouds and winds against what I am comfortable flying with, Takeoff does it for me. Add that with quick support and constant updates and that makes Takeoff the best in aviation weather. Absolutely LOVE this app! I use another web interface for full briefings, but this app provides a fantastic way to see current conditions. Fast and simple without clutter! The developer is very responsive to suggestions and keeps adding features while still keeping the interface clean. This is a must have app if you're a pilot! Do you test this stuff? On a couple of airports there is too much information than some of the other airports, but you can't scroll to read the information- it's chopped off at the bottom of the screen. What's up with arrows for headwind, tailwind? Everything's crammed together, wasted space on the right side column. Very well polished and has everything I could need for my flying needs. Highly recommended. 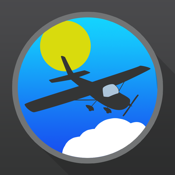 You can get several aviation weather apps that get you weather data. These guys went one big step further - rather than just spitting the data back out in another format they transform it into very useful information. Combining weather with personal minimums is brilliant, that is really what we do every time we get aviation weather. What we want to know is, can we fly? This app makes that easy to see at a glance. It is now my first stop for flight planning. As a new pilot I love this app. Straight forward, easy to use, with everything you need in one place. A must for new or experienced pilots! Everything the aviator needs to plan and stay informed about weather. Very useful app. I highly recommend! Really like the crosswind componet tool. showing all the runways for the airport is most helpful. Be nice if you can make this work in the air. Another suggestion, if you can add rynway lenght and width as well as paved and unpaved for folks that fly bigger airplanes. If you can put it just to the right of the xwind info that would be most helpful/ Maybe highlight the most favorable would be nice. Thanks. For airline pilots: Needs higher xwind limits - at least 35 knots (plus add gust factor) Also a takeoff limit and landing limit Also color code taf (like ForeFlight) but add more limit options on weather as well. Like exemption 3585, Add the ability to have departure airport(with takeoff limits) destination (with landing limits) and if the alternate meets limits - all color coded. Just quick fields like: Dept Ete Dest Alt. My 2cents in. I'm a flight instructor, and was quite excited to find this program with it's very appealing graphical interface. "Unfortunately it at times provides grossly inaccurate crosswind wind calculations." These issues appear to have been addressed. I will double-check results and hope all is fixed. I am very pleased with this app. I am a relatively new VFR pilot just beginning to travel on longer cross country flights. This app makes it so simple to determine go vs. no go - at my comfort level. I have told all my pilot friends about it.